This rare suite has it all - best location in Fairview in a small quiet, exclusive complex! This end unit features a great floorplan with 2 large bedrooms & 1.5 baths, an amazing view from the living area and the roof deck, and private 2 car garage (accessed from the suite). 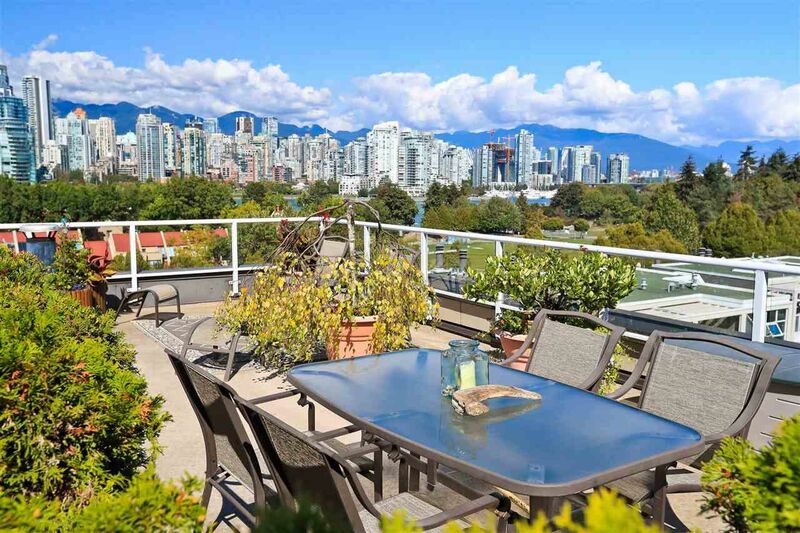 The 30' x 15' roof deck has a breathtaking city and mountain view. The garage is perfect for a car or outdoor enthusiast - lots of room for your toys, plus a workshop and plenty of storage in the private garage. Complex also has a gym, sauna and racquetball court - it is all here. Minutes to Skytrain / Canada Line, 99 B-Line to UBC and Granville Island & Downtown - and on the bike route too! NOTE: sq footage from strata plan: 1,068 sf living space/ 1,585 sf incl garage.